Fried okra is a tasty treat. Just coat okra with beaten egg and then seasoned corn meal, corn flour, or semolina to give it an extra crunch. You can fry the pods whole, but there's nothing wrong with cutting the okra into bite-size pieces first to fry up into popcorn-like snacks. In either case, serve them plain, or offer a spiced aioli for dipping. Okra is in season from July through September. It grows in hot, humid climates such as the Southern states, so you may not find local okra if you live in some parts of the U.S. You will want to use okra when it is fresh, preferably within a day or two of purchase. It will begin to get brown around the stem end after it is picked, and the amount of brown will indicate how fresh it is. Trim the stem ends off the okra pods. Cut the pods into bite-size pieces, if you like. Set aside. In a large bowl, beat the eggs with 2 tablespoons water. Beat them well so the mixture is of a uniform, watery consistency. Set aside. In a second large bowl, combine the cornmeal, salt, pepper, and optional cayenne. Set aside. In a large heavy pot, heat at least half an inch of oil to 350 F to 375 F. Measure the temperature with a thermometer. Or, test it by dipping a piece of bread or the handle of a wooden spoon into the oil—it should sizzle immediately and steadily. If it doesn't sizzle, it's not hot enough. If it bubbles up violently, it is too hot. While the oil heats, put the okra in the egg and toss it to thoroughly coat the pods. Lift the okra out, letting as much excess egg drip off as possible (you can also simply strain it in a colander​ if you prefer). Working in batches of 4 or 5 pods, use one hand to put the egg-coated okra in the cornmeal and the other hand to toss it to coat it completely with the cornmeal mixture. Note that you're using one hand to touch the wet okra and one hand to touch the dry cornmeal. Put the coated okra on a plate or baking sheet. Repeat with remaining okra pods. Fry the coated okra in batches. The pods should be in a single layer and they shouldn't touch. 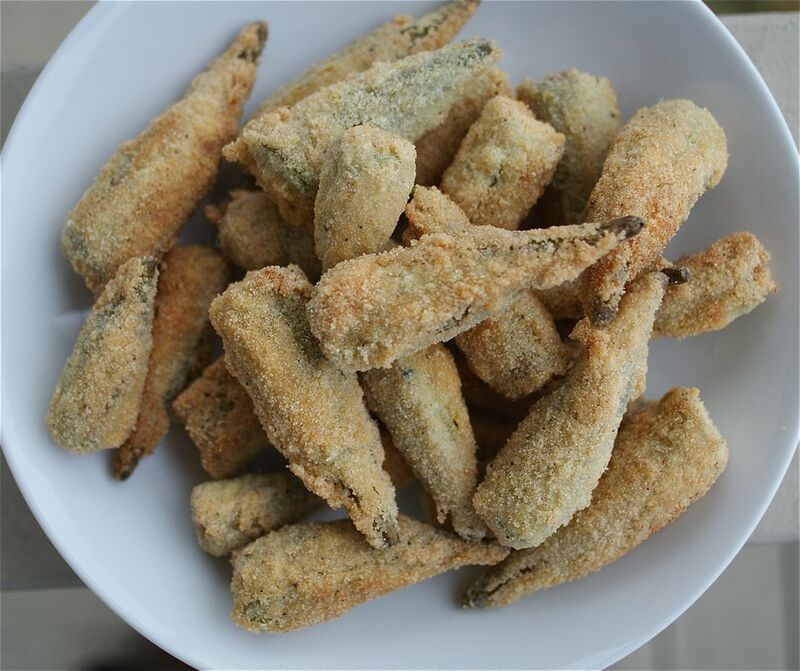 Fry each batch until the coating turns brown and crispy (and the okra is tender inside). Use tongs or a slotted spoon to transfer the cooked okra to a layer of paper towels to drain. Repeat with the remaining okra. Serve fried okra hot, sprinkled with additional salt, if you like.